In the 1930s, Jesus revealed Himself to a simple and holy nun, Sister Faustina of the Congregation of the Sisters of Our Lady of Mercy in Poland. Jesus appeared to Sister Faustina in a vision with rays of mercy streaming from His Heart. Jesus called her to be the secretary and apostle of His mercy. Jesus said to her “Speak to the world about my mercy” (Diary, 229). Jesus told her to record His message of mercy in a Diary, her mission, to share that mercy with the whole world. Jesus instructed Sister Faustina to remind the world about God's unfathomable mercy. She was to accomplish this by introducing new devotions and practices He had given to her to honor His mercy, thereby establishing a worldwide movement of refreshed souls dedicated to living and spreading Divine Mercy. Through Sister Faustina, Our Lord gave us special means of drawing on His mercy:The Image, The Feast, The Chaplet, The Novena, The Hour. To each of them the Lord attached promises of special graces. It is Divine Mercy He said that will determine the future destiny of the world. Jesus said to Sister Faustina: “Speak to the world about my mercy; let all mankind recognize My unfathomable mercy. It is a sign for the end times; after it will come the day of justice. While there is still time, let them have recourse to the fount of My mercy” (Diary, 848). On April 30, 2000, the Great Pope John Paul II canonized Sister Faustina as a Saint of the Church. She is now known to us as Saint Maria Faustina of Divine Mercy. The Holy Father also announced during his homily that the Second Sunday of Easter would now be celebrated as Divine Mercy Sunday throughout the universal Church. What is this message of Divine Mercy for today’s youth? The message is simple. Jesus loves us -all of us. And He wants us to know that He has opened His Heart as a living fountain of mercy. Jesus wants us to recognize that His Mercy is greater than our sins, our weakness, than any darkness we may encounter, so that we will call upon Him with trust, receive His mercy, and let it flow through our heart to others. Thus, all will come to share in the joy of His love, here on earth, and in heaven. What Does Divine Mercy Mean? Divine Mercy is God’s love reaching down to meet the needs and overcome the miseries of His children. What is Divine Mercy? Divine Mercy is the power of God’s Divine Love, which flows out upon those in need. God’s very nature is love, an infinite, eternal self-giving love among the Father, the Son, and the Holy Spirit. Mercy, then we can say, is God’s love that overflows from His divine life upon us, giving our soul new life, a soul that is in need of God’s merciful and saving love. 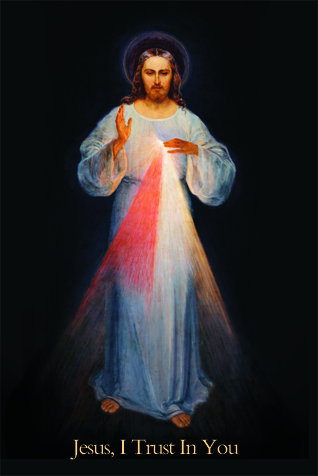 The Image of the Divine Mercy: In 1931, Our Lord appeared to Saint Faustina in a vision. She saw Jesus clothed in a white garment with His right hand raised in blessing. His left hand was touching His garment in the area of the Heart, from where two large rays came forth, one red and the other pale. She gazed intently at the Lord in silence, her soul filled with awe, but also with great joy. Jesus said to her: Paint an image according to the pattern you see with the signature: Jesus, I trust in You. I promise that the soul that will venerate this image will not perish. I also promise victory over [its] enemies already here on earth, especially at the hour of death. I Myself will defend it as My own glory (Diary, 47, 48). Jesus taught Saint Faustina that His mercy is unlimited and even the worst and most hopeless sinner was deserving of God’s infinite mercy. Jesus offered this Image to remind people to trust in His mercy, and to come to Him for mercy: “I am offering people a vessel with which they are to keep coming for graces to the fountain of mercy. That vessel is this image with the signature: “Jesus I trust in You” (Diary, 327). I desire that this image be venerated, first in your chapel, and [then] throughout the world (47). Jesus said: “The two rays denote Blood and Water. The pale ray stands for the Water which makes souls righteous. The red ray stands for the Blood which is the life of souls… These two rays issued forth from the very depths of My tender mercy when My agonized Heart was opened by a lance on the Cross” (Diary, 299). Jesus said: Proclaim that mercy is the greatest attribute of God. All the works of My hands are crowned with mercy. (Diary, 301). The Feast of Mercy: Our Lord asked Saint Faustina to pray and work towards establishing a Feast of the Divine Mercy on the Sunday after Easter. He told her: “tell the whole world about My inconceivable mercy. I desire that the Feast of Mercy be a refuge and shelter for all souls, and especially for poor sinners. On that day the very depths of My tender mercy are open. I pour out a whole ocean of graces upon those souls who approach the Fount of My Mercy. The soul that will go to Confession and receive Holy Communion will obtain complete forgiveness of sins and punishment” (Diary, 699) Our Lord promised. The Chaplet of Divine Mercy: Our Lord taught Saint Faustina a prayer for mercy that she was to pray unceasingly. He told her that, if she prayed in this way, her prayers would have great power for the conversion of sinners. Jesus said: “Say unceasingly the chaplet that I have taught you” (Diary, 687). In subsequent revelations, the Lord made it clear that the chaplet was not just for her, but for the whole world. He also attached extraordinary promises to its recitation. “Encourage souls to say the Chaplet which I have given you” (Diary, 1541). “The souls that say this chaplet will be embraced by My mercy during their lifetime and especially at the hour of their death” (Diary, 754) Our Lord promised. Again Jesus tells us: “Whoever will recite it will receive great mercy at the hour of death” (Diary, 687). Jesus said to Saint Faustina: “When they say this chaplet in the presence of the dying, I will stand between My Father and the dying person, not as the just Judge but as the Merciful Savior” (1541). Priests will recommend it to sinners as their last hope of salvation. Even if there were a sinner most hardened, if he were to recite this chaplet only once, he would receive grace from My infinite mercy (687). “I desire to grant unimaginable graces to those souls who trust in My mercy“ (687). “Through the Chaplet you will obtain everything, if what you ask for is compatible with My will” (Diary, 1731). “Oh, what great graces I will grant to souls who say this chaplet; the very depths of My tender mercy are stirred for the sake of those who say the chaplet” (Diary, 848). The Novena to The Divine Mercy: In preparation for the Feast of the Divine Mercy, the Lord asked Saint Faustina to make a novena (nine days) of prayer from Good Friday to the following Saturday. Jesus said: “By this novena, I will grant every possible grace to souls” (Diary, 796) Our Lord promised. Jesus instructed Saint Faustina on how to make this novena. The novena starting on Good Friday consisted of praying the Chaplet of Divine Mercy for nine days before the Feast of Mercy. Jesus instructed Saint Faustina to bring to His Heart a different group of souls each day. Jesus, Himself, dictated the intentions for each day. Jesus said: “I desire that during these nine days you bring souls to the fountain of My mercy, that they may draw therefrom strength and refreshment and whatever grace they need in the hardships of life, and especially at the hour of death. On each day you will bring to My Heart a different group of souls, and you will immerse them in this ocean of My mercy” (Diary, 1209). First Day: ‘Today, bring to Me all mankind, especially all sinners”. Second Day: “Today bring to Me the souls of priests and religious’. Third Day: “Today bring to Me all devout and faithful souls”. Fourth Day: “Today bring to Me the pagans (those who do not believe in God) and those who do not yet know Me”. Fifth Day: “Today bring to Me the souls of heretics and schismatics” (the souls of those who have separated themselves from My church). Sixth Day: “Today bring to Me the meek and humble souls and the souls of little children”. Seventh Day: “Today bring to Me the souls who especially venerate and glorify My mercy“. Eighth Day: Today bring to Me the souls who are in the prison of Purgatory”. Ninth Day: “Today bring to Me souls who have become lukewarm” (Diary, 1209). The Hour of Great Mercy: in His revelations to Saint Faustina, Jesus asked for special, daily remembrance at three o'clock, the very hour He died for us on the cross. Jesus said: “At three o’clock, implore My mercy, especially for sinners; and, if only for a brief moment, immerse yourself in My Passion, particularly in My abandonment at the moment of agony. This is the hour of great mercy for the whole world. I will allow you to enter into My mortal sorrow. In this hour, I will refuse nothing to the soul that makes a request of Me in virtue of My Passion….” (Diary, 1320) Our Lord promised. Three ways of exercising mercy: Jesus speaks to us all through the example of Saint Faustina. Jesus said to Saint Faustina: “I demand from you deeds of mercy, which are to arise out of love for Me. You are to show mercy to your neighbors always and everywhere. … I am giving you three ways of exercising mercy toward your neighbor: the first – by deed, the second – by word, the third – by prayer: In these three degrees is contained the fullness of mercy, and it is an unquestionable proof of love for Me” (Diary, 742). “Be always merciful as I am merciful. Love everyone out of love for Me, even your greatest enemies, so that My mercy may be fully reflected in your heart” (Diary, 1695). Prayer for conversion: Jesus said to Saint Faustina, “the prayer most pleasing to Me is prayer for the conversion of sinners. Know, My daughter, that this prayer is always heard and answered” (Diary, 1397). I desire that you know more profoundly the love that burns in My Heart for souls, and you will understand this when you meditate upon My Passion. Jesus said: “Call upon My mercy on behalf of sinners; I desire their salvation. When you say this prayer, with a contrite heart and with faith on behalf of some sinner, I will give him the grace of conversion. This is the prayer: O Blood and Water, which gushed fourth from the Heart of Jesus as a fount of Mercy for us, I trust in you” (Diary, 186-187). Mercy the last hope of salvation: Jesus said: “I am giving mankind the last hope of salvation; that is, recourse to My mercy” (Diary, 998). “Before the Day of Justice I am sending the Day of Mercy” (Diary, 1588). “Mankind will not have peace until it turns with trust to My mercy” (Diary, 300). The Mission of Saint Faustina is ours: Jesus said to Saint Faustina: “Speak to the world about my mercy” (Diary, 229). Jesus said to Saint Faustina: “My daughter give Me souls. Know that it is your mission to win souls for Me by prayer and sacrifice, and by encouraging them to trust in My mercy” (Diary, 1690).